Reformed East Sussex Services C.I.C is a Community Interest Company that provides innovative solutions to the problems of social exclusion and specialising in the issues faced by offenders and recovering addicts when looking for employment. Support is provided by workers who are “experts by experience” and services are aimed at all those who are in recovery and/or have been subject to the criminal justice system. Reformed currently provides support to members of these groups to either find employment and/or increase their employability. Reformed offers accredited training, working with clients on their presentation, interview skills and developing their CV. Sussex Pathways offer a range of effective services across several areas of the justice sector to empower ex-offenders to make positive life choices. Sussex Prisoners' Families - is a community interest company which supports local families to cope emotionally and practically with the imprisonment of a loved-one. They offer support and advice to families, as well as training and awareness-raising for professionals so that they can better meet families’ needs. Calling East Sussex organisations who wish to help raise awareness about the impact of scams / fraud. To sign up to the East Sussex Against Scams Partnership Charter and / or find out more details, visit the webpage and then email by clicking here. 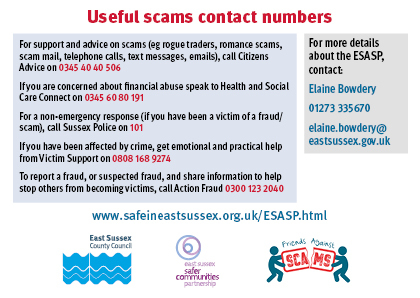 We particularly encourage the sharing of the Useful scams contact numbers and latest ESASP Scams Bulletin (on the webpage). Web site design Copyright 2009, Safe in East Sussex.com. All Rights Reserved.